One of the most important and often overlooked area of the fireplace chimney system is the smoke chamber. It’s the area above your damper where it angles up, funneling hot flue gasses to the bottom of the clay tile liner, where it resumes its exodus from the home in the lined portion of the chimney. More and more customers these days have become knowledgeable about chimney liners. These are the two inch thick clay tile sections built inside the brick masonry walls of the chimney , providing gas tight, heat resistant protection of the structure. 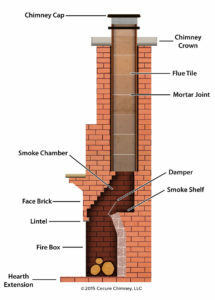 Most know that an unlined chimney is an unsafe vent as heat can transfer through the brick to the surrounding structure of the home, which is typically wood. 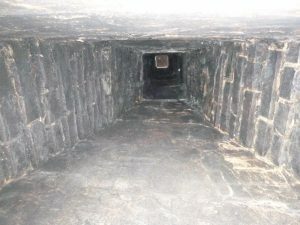 The smoke chamber is unprotected by chimney lining and is generally left as exposed brick in a highest heat area of the chimney. This can allow the heat to transfer to the surrounding combustibles that are often built around the chimney. The brick chamber is built by stepping in the brick (corbelling) creating a high turbulence area which affects the performance and drafting of a fireplace. This also provides an area with nooks and crannies for damaging acidic and flammable creosote to build up , causing further deterioration to the system, and obviously a potential fire hazard. Both the National Fire Protection Agency (NFPA) AND Connecticut’s code, International Residential Code (IRC), call for the area to parged smooth with a high temperature refractory mortar. Unfortunately, this is rarely done in original construction in Connecticut. Safeside Chimney performs level I inspections that include this area, to see if your chimney was built to current standards. Safeside Chimney uses two particular products to resolve these issues, depending on the situation. We use Chamber Coat when the area can be hand parged, generally when we perform total restorations. Or we use Heatsheild’s Cerfractory Foam when spraying the chamber is the appropriate application. 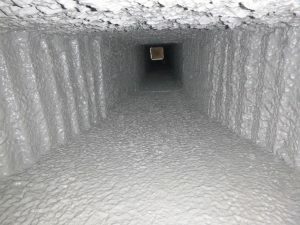 Both products insulate, seal gaps, and smooth the smoke chamber walls as required by both NFPA and IRC codes and making your chimney safer, more efficient, and easier to clean. Click on the images below for detailed brochures. Completed a thorough inspection in addition to cleaning. Shared advice on avoiding up-sell of unnecessary services from competitors. Very professional and knowledgable. In the process of setting up another appointment for additional work before I can rate the quality. Safeside Chimney is one of CT’s leading Chimney service providers. Over the years, Safeside Chimney has serviced thousands of satisfied customers on an annual basis. Safeside Chimney currently services approximately 5000 + homes a year.